The navigation in the course is not accomplished by a default playbar but by custom navigation buttons. To make it simple, I will use only three buttons in my example: SB_Next, SB_Back and SB_Home. On some slides the navigation buttons have to be hidden, maybe because dedicated buttons will appear at the end of the slide, thus forcing viewing the slide. Because of that request, it is not possible to have the shape buttons on the master slide because they wouldn’t have an ID, which means you cannot control their visibility. The Shape buttons have to be on the first slide, Timed for the rest of the project, always on top. This is only possible with shape buttons not with the three old types of buttons. Beware: if you use a responsive project developed with Fluid Boxes, objects timed for the rest of the project are not allowed. You see that I grouped the three buttons in Gr_Buttons, contrary to the user who had several Hide commands. Whiy is this tricky? First of all, if you change the sequence of slides, add or delete slides, you’ll have to check the advanced action and change the literals (slide numbers). Moreover this long condition has to be attached On Enter for each slide, has to be evaluated on each slide, I don’t like that type of long conditions. If you need to use this action for another course, you have to edit the condition, take into account the number of slides where you have to hide, and the exact slide numbers. 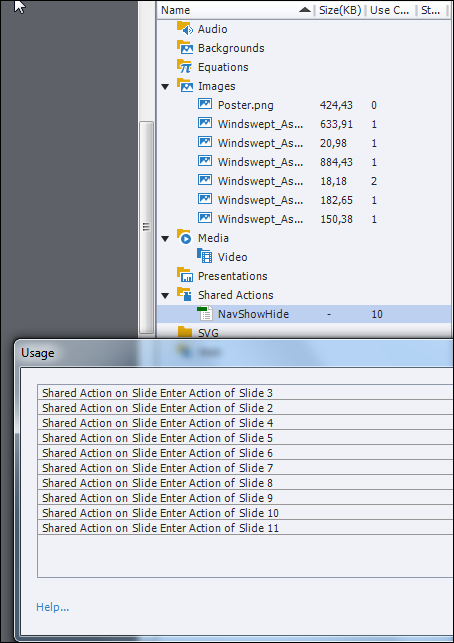 Copying an advanced action from one course to another course is always a pain if the action is attached to a slide event, which is the case here . 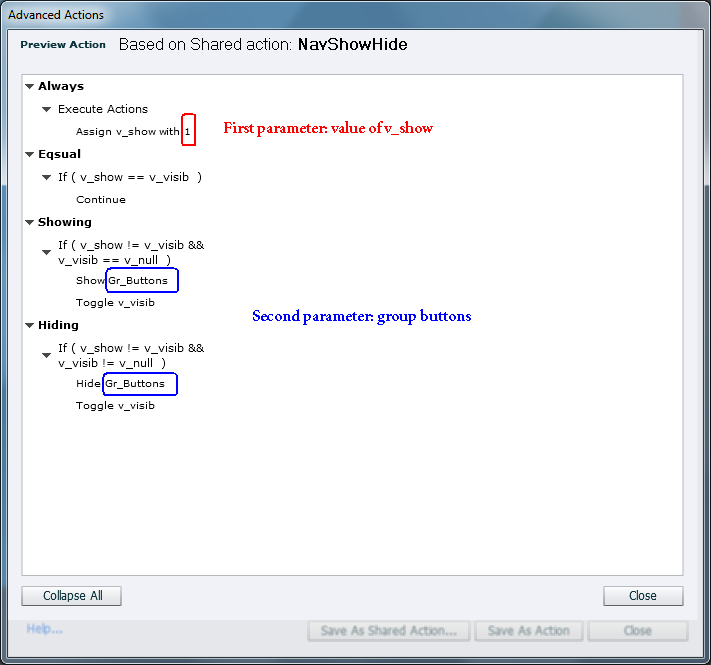 v_show: has a default value of 1, because in the default setting the buttons are visible. This value is the only non-compulsory parameter, can be changed to 0 if the buttons have to be hidden. v_visib: one of my popular variables which I import with a shared action as described in my recent post. v_null: because I had to avoid double use of the literal 0, I used this variable with a default value of 0, it is also described in the same post. The only variable that will be changed is the first one, you don’t have to bother about the other two variables. You have to add this shared action On Enter for each slide. This cannot be done for all slides at once. I’m sorry, but you always have to define the Button group as parameter, my request to be able to promote a non-variable/literal to the status of being always the same is not yet heard. The other parameter (value of v_show) has to be 0 for the slides where the buttons have to be hidden, and 1 for those where you want them visible. Here is an example for a slide where they have to be invisible. Import it into your course, the variables will be created automatically. 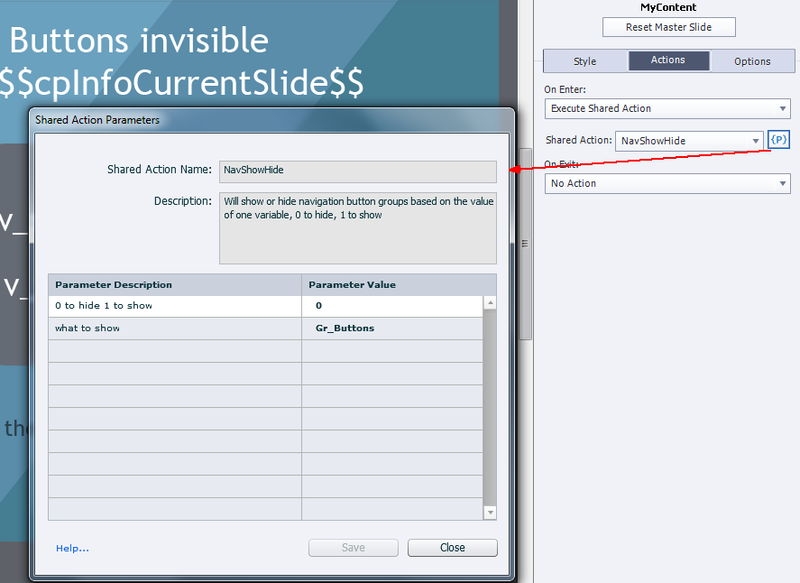 You have to create only what you want to hide/show on the slides, group those objects and name them. Now you are ready to use that action On Enter for each slide. The group to be hidden/shown can have any objects, not only buttons. It is only necessary, that the group is displayed for the rest of the project. If you use a lot of literals you have to choose carefully which one can be come a parameter to avoid issues with the action. That is very important if the same literal is used in multiple decisions. It led to my choice of having an empty variable. This kind of problem never happens for advanced actions. You need a different mindset, but that is of course my personal opinion based on lot of testing since shared actions appeared years ago. Sequence is very important in any action, same as for advanced actions. Lot of consultancy jobs where I had to debug actions were due to ignoring this, combined with the typical behavior that you cannot break out of an advanced/shared action as is possible with programming languages. I would like to explain this in depth, but not with a blog post. A webinar/training or live presentation is the only way to get this done. I expect this to remain a daydream…. very frustrating.